A Florida judge has ruled against raising George Zimmerman's bail bond, despite a complaint he had not disclosed some $200,000 from donors. Mr Zimmerman was released on Monday after paying $15,000 (£9,300), equal to 10% of his $150,000 bail. His lawyer argued he was penniless. Judge Kenneth Lester said he needed more information about the fundraising before he could reconsider the bond. 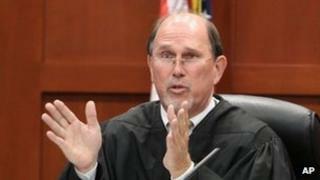 He is charged with second degree murder over the death of Trayvon Martin. Mr Zimmerman maintains he shot the unarmed black teenager in self-defence. Prosecutor Bernardo de la Rionda argued that the bail bond amount should be reconsidered because Mr Zimmerman's lawyer had disclosed on Thursday that his client had received some $200,000 in donations. Benjamin Crump, lawyer for Trayvon Martin's family lawyer, agreed: "The court was led to believe that he [Zimmerman] had no money and was indigent. "He either did not tell his lawyer or if he did tell his lawyer he did not discuss it with the judge." Mr Zimmerman has not been seen since leaving jail on Monday. His destination was kept secret in an effort to ensure his safety. The death of Trayvon Martin, who was shot by George Zimmerman on 26 February, has divided the US. Florida police did not arrest Mr Zimmerman for six weeks after the shooting. Under the state's controversial "stand your ground" law the use of lethal force is allowed if a person feels seriously under threat.